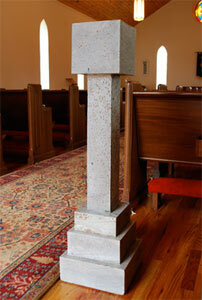 The font was originally built and used in Ascension Episcopal Church. Ascension was consecrated in 1881 and was closed in 1917. The font is particularly significant to Saint Peter’s and Phoebe Needles because it was used to baptize Esom Sloan, who had helped to found the first church (Emmanuel Episcopal Church) on the property, and the Phoebe Needles School. The soapstone was mined locally, and was commonly used at the time in fireplace hearths. The font is made of five pieces of soapstone connected together with a threaded rod. At some point the natural soapstone had been painted white. After many years of use, and the soft nature of soapstone, the font became wobbly, and a wooden exterior was built around it to hold it together. The baptismal font was restored in 2010 to the original polished soapstone, by David Conroy of Stone Age Masonry in Willis, Virginia. The brownish “pock marks” in the gray soapstone are bits of the red clay that remain as “imperfections. 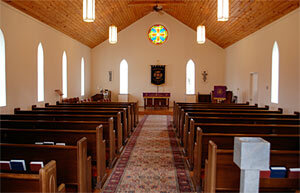 The stained glass window was installed when the church renovation was begun May 2002, and dedicated on May 4th, 2003. 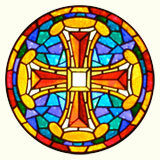 The window was designed by Vincent Ketchie of Law’s Stained Glass Studio, in Statesville, North Carolina. The window was given by Bolling and Christie Izard to the Glory of God, and in loving memory of Bolling’s brother, James Johnston Izard, Jr.
First off, to write a history of Saint Peter’s-in-the-Mountains is to write about the history of the Phoebe Needles School; the two are most certainly intertwined. Second, to write a history of anything I suppose, but most definitely of Saint Peter’s and Phoebe Needles, is to create one more version of how this place developed that may or may not be entirely factual. In my years at Saint Peter’s, I have rarely found two people who agree on exactly what happened around here or when. So this may not contain many accurate facts, but I hope it will capture the truth. Sometime along about 1899 Mr. Esom Sloan and the Reverend Mr. Alexander Barr came together with a common idea. Their idea was to establish a school to educate the children living within a few miles of where the church stands today. They wanted to be able to provide the basics of reading, writing and arithmetic, but also teach religious education. They sought to educate the mind, body and spirit. Oddly, Phoebe Needles was not the first school and Saint Peter’s was not the first Episcopal Church on the current site. But that comes a bit later…. Mr. Sloan and his family were all German Baptists. He owned a gristmill and a great amount of land about one half mile down Turners Creek Road toward Ferrum from where the church stands today. The story goes that he went to a burial service at Ascension Episcopal Church just near the intersection of Six Mile Post and Ferrum Mountain roads. Mr. Sloan was so impressed with the “eloquent preaching” of Mr. Barr at the burial service that he decided to bring his whole family the following Sunday to have them baptized. Sometime in the next two years he decided Ascension was too far travel (they did not have the good roads we have today!) 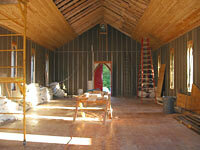 and donated an acre of land at the foothills of the Blue Ridge Mountains, to build a church nearer to his home. In 1902, Mr. Slone and the Reverend W. T. Roberts built a small wooden schoolhouse with two classrooms on the first floor and living quarters above to house two teachers. It was called Saint Peter’s Mission School. It was Mr. Roberts who had the vision to build a church to further expand the educational opportunities in the community. A couple hundred yards away the first church was built. It was a small wooden rectangular building with a vestibule attached to the front. It was consecrated Emmanuel Church in 1904. Mr. Sloan died in 1908, and he and his wife, Eliza, are buried right behind the Phoebe Needles School. Emmanuel Church blew down in a terrible snowstorm on the night of March 1-2, 1914. Construction on a new church began in 1915, but was not completed until 1921 because of the war. The new church was named Saint Peter’s, since it was the apostle Peter who was the “rock of the Church,” and because Mr. Peter Saunders of Bleak Hill, was a substantial contributor to the new church. Meanwhile Mr. Arthur C. Needles, president of the Norfolk and Western Railroad purchased some additional land and donated the money to build a school in honor of his daughter Phoebe who died at age six of meningitis. Although Mr. Needles was a Quaker, he had a connection to Episcopal Church through the rector of Saint John’s in Roanoke. The Needles family continued to support the school in many ways until his death in 1936. The school was finished in 1917, and stands today where the original school stood. Caryetta Davis (known as Miss Etta), the daughter of an Episcopal priest, taught at the school for thirty years. Miss Etta was widely known and respected throughout the community. There were many other teachers who are well remembered for their substantial contributions to the people of this community: Agatha Saunders, Mamie Montgomery, M. Baker, Susie Saunders, Mary Saunders, Louisa Wood, Betty Clenearly, Nell Strayer Roberts, Alberta Booth, Octavia Ulma and Agatha Walker Pennybacker. For the first forty years of life at Saint Peter’s, the minister of Trinity in Rocky Mount came to officiate at the services once a month. The Reverend Mr. William Henderson was the first full time priest to serve at Saint Peter’s. He served as rector from 1974 to 1979. The Reverend Mr. W. George Beale served a second time at the church after retiring from Grace Cathedral in San Francisco. He came back to the area in 1968, having served as the rector of Trinity and vicar of Saint Peter’s in the 1940’s. He and his family lived in the teacher’s house built in 1911, now known to as the rectory. In 1943 women church workers came to Saint Peter’s. They were known as the deaconesses, and served at the church and the school for many years. They were trained and sent out into mission fields by the United Thank Offering (a national organization of Episcopal church women). They provided courageous leadership during hard times. Deaconess Margaret Booz and Deaconess Newman are fondly remembered for their service, love and dedication to the people of Saint Peter’s. In addition to leading worship services at the church, they also sponsored a women’s auxiliary, sewing groups, taught classes on homemaking skills, provided a clothing bank and served the community in many other ways. Around 1962 the church was remodeled for the first time. The concrete walls were plastered and painted white, a “drop” ceiling was installed and a partition wall built to create a backdrop for the altar. The parish hall was added in 1974 and dedicated in memory of Mr. Henderson. In 2002, the church was remodeled again, this time removing the drop ceiling, replacing the windows and floor, removing the partition wall and adding a stain glass window in the north wall of the church depicting a Canterbury Cross. Those of us who are “newcomers” cannot help but know as we worship in this holy and special place that “we have drunk from wells we did not dig, and been warmed by fires we did not build.” There are many people who have made Saint Peter’s what it is today, but this history would be remiss if I failed to mention the lifetime commitment and leadership of Hilda Pendleton Guilliams and Mary Cannaday Prillaman. Both, during their time, embodied a living faith that has drawn in many people who still worship at Saint Peter’s today. Their spirit created a legacy and a standard that most of us can only try to achieve in our lives. And that is more or less how things came to be at Saint Peter’s-in-the-Mountains…. Today, perhaps like then, we are an eclectic group, of warm, friendly people who do our best to “love our neighbor,” serve those in need, and welcome all who come to worship with us. That and good food shared together have been the common thread through the generations. The people of Saint Peter’s-in-the-Mountains welcome and invite you to join us for worship, education, and fellowship any Sunday you find yourself over by the Rock Church.